Every new generation of the iPad has made the tablet more powerful and more useful, but the basic hardware features of the device have stayed roughly the same. There have been some slight variations and enhancements, but generally speaking, the ports, buttons, and switches present on the 1st Generation iPad have also appeared in modified forms on later models. If you know what all the hardware on the first generation iPad is used for, you'll be able to get the most out of your iPad. Home Button: This is maybe the most important—certainly the most used—button on the iPad. You press this button when you want to exit an app and return to the home screen. It's also involved in restarting a frozen iPad and is clicked when you complete the process of rearranging your apps and adding new screens. Double-clicking it reveals the multitasking menu. Dock Connector: This wide port on the bottom of the iPad is where you plug in the included USB cable to sync your tablet and your computer. On the 1st gen. iPad, this is the 30-pin connector. Later iPads replaced it with the smaller, 9-pin Lightning connector. Some accessories, like speaker docks, connect here, too. Speakers: The built-in speakers on the bottom of the iPad play music and audio from movies, games, and apps. Sleep/Wake Button: The most-important button on the iPad. This button locks the iPad's screen and puts the device to sleep. Clicking it when the iPad is asleep wakes the device up. It's also one of the buttons you hold to restart a frozen iPad or to turn the tablet off. Antenna Cover: This small strip of black plastic is found only on iPads that have 3G connectivity built in. The strip covers the 3G antenna and allows the 3G cellular signal to reach the iPad. Wi-Fi-only iPads don't have this; they have solid gray back panels. This cover is present on later iPad models with cellular connections, too. Mute Switch: Toggling this switch on the side of the device mutes the volume of the iPad (or unmutes it, of course). Prior to iOS 4.2, this button was used exclusively as the screen orientation lock, which prevented the iPad's screen from automatically switching from landscape to portrait mode (or vice versa) when you changed the orientation of the device. In iOS 4.2 and higher, the user can control what the switch does, choosing between muting the volume and the screen orientation lock. Volume Controls: Use these buttons to raise or lower the volume of the audio played through the speakers at the bottom of the iPad. Most apps that play audio also have software features that control volume. Headphone Jack: This standard jack is used for headphones. Some accessories also connect to the iPad through it. 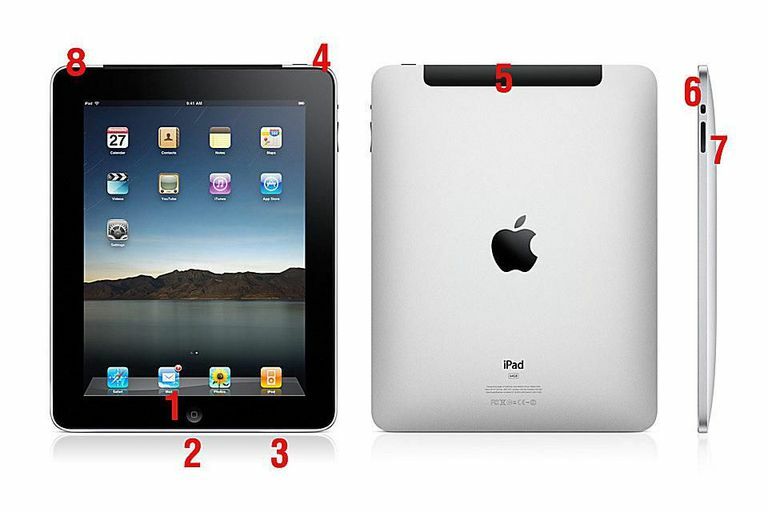 Apple A4 Processor: The brain that powers the 1st Gen. iPad is a 1 GHz Apple A4 processor. This is the same chip used in the iPhone 4. Accelerometer: This sensor helps the iPad detect how it's being held and moved. It is used to reorient the screen when you change how you're holding the iPad. It's also used for things like games that are controlled based on how you move the iPad itself. Ambient Light Sensor: This sensor helps the iPad detect how much light is present in the location where it's being used. Then, depending on your settings, the iPad can automatically adjust its screen brightness to save battery life. Networking Chips: Every 1st Generation iPad has Bluetooth for networking with accessories and Wi-Fi for getting online. As mentioned earlier, some models also have 3G cellular connections so they can get online almost anywhere. There is one major missing feature from the 1st Generation iPad: cameras. The original iPad didn't have any. As a result, it lacked the ability to take photos, shoot videos, or make FaceTime video calls. That omission was remedied with its successor, the iPad 2, which sported cameras on both the front and back.